Gat gro-Shargakh is an Orc miner. 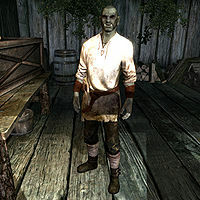 He and Pavo Attius were the only miners to survive the Forsworn invasion of Kolskeggr Mine. Both have fled to Left Hand Mine. Should you clear out the Forsworn from Kolskeggr during the related quest, Gat will return to the mine. If Gat happens to die, his remains can be found in the Markarth Hall of the Dead. He wears the standard miner's clothes and a pair of boots. He wields a pickaxe and carries a key to the Left Hand Miner's Barracks, a key to Pavo's House, and a selection of lower-class gold and loot. He can initially be found outside of Left Hand Mine with Pavo, and waits there with Pavo and Skaggi Scar-Face. When the town disperses he heads with Pavo to the Miner's Barracks where he then stays twenty-four hours a day. When the mines are reopened, he heads back to Kolskeggr to get to work. He now wakes up at 8am and immediately heads to the mines and works for twelve hours. At 8pm he heads back to Pavo's house and relaxes for four hours. Then finally at midnight, he heads to bed. When he's at Left Hand Mine, he often talks about Kolskeggr and seems relieved that he lived through the attack, "Pavo and I had to fight our way out of Kolskeggr. Forsworn killed everyone else." or "Thank Malacath we got out of Kolskeggr alive." He also shows some admiration for Pavo, saying, "Don't know what I would have done without Pavo. Man's braver than he admits." When he's back mining at Kolskeggr, he'll be glad about it, saying, "It's good to be mining again." or "I've never seen Pavo so happy. It's good to be back in Kolskeggr." Upon raising his disposition, he will become a potential candidate for marriage. Helping him clear out the mine also makes you Blood-Kin if not already.